In a wild Oval Office confrontation, President Donald Trump heatedly threatened to shut down the U.S. government Tuesday as he and Democratic leaders bickered over funding for his promised border wall and offered a grim preview of life in Washington the next two years under divided government. 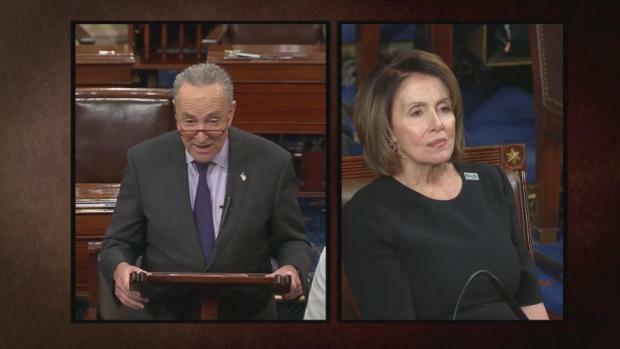 Trump and House and Senate Democratic leaders Nancy Pelosi and Chuck Schumer squabbled for more than 15 minutes in the stunning, televised encounter. Each of them, especially Trump, interrupted the others to question facts, quibble over election results and lob insults. Trump questioned Pelosi's ability to count votes in her own House. She questioned his manhood — after she left the building. The public clash marked Trump's first meeting with the newly empowered Democrats since their midterm victories that put them in control of the House, laying bare the tensions on both sides and suggesting how divided government might work — or not — as the 2020 presidential election nears. Neither the public nor the private face-to-face portion of the meeting appeared to resolve the wall-funding dispute with a partial shutdown looming on Dec. 21. However, Pelosi said Trump called her later in the afternoon and told her the White House was looking at options she and Schumer had laid out. In the public debate, Trump sounded more determined than ever to allow a partial government shutdown unless he gets the billions he wants for his long-promised wall along the U.S.-Mexico border. At one point Trump said, "I would be proud to shut down the government for border security." "I will take the mantle. I will be the one to shut it down," he declared. Pelosi later crowed that she and Schumer had goaded the president to "fully own that the shutdown was his." She told Democratic lawmakers back at the Capitol, according to an aide who was in the room, that the wall was "like a manhood thing for him ... as if manhood could ever be associated with him. This wall thing." She added, "It goes to show you: You get into a tinkle contest with a skunk, you get tinkle all over you." The aide was not authorized to speak publicly and commented only on condition of anonymity. While Trump has suggested he may be willing to trade with Democrats and has publicly praised Pelosi, he was focused Tuesday on reinforcing his hardline immigration promises, repeatedly stressing border security and the wall as a critical part. Democrats were in no mood to sympathize, emphasizing their newfound political strength. "Elections have consequences, Mr. President," said Schumer. Trump later called it a "friendly meeting," saying "I've actually liked them for a long period of time and I respect them both. And we made a lot of progress." The Democrats said they had given Trump two options to keep government open and the responsibility lay with him and Republicans who control Congress. The wall remains the main sticking point in talks. Republican House Speaker Paul Ryan acknowledged Tuesday that the GOP-led House has yet to pass legislation that includes the $5 billion in border wall funds that Trump has been requesting. Ryan likely lacks sufficient votes from Republicans who will lose their majority at the end of the month. Should the two sides not make a deal by Dec. 21, about three-quarters of the government would continue to have enough money to operate. But departments affected absent a deal include Homeland Security, Transportation, Agriculture, State and Justice, as well as national parks. Both sides came into the negotiating session primed for battle. 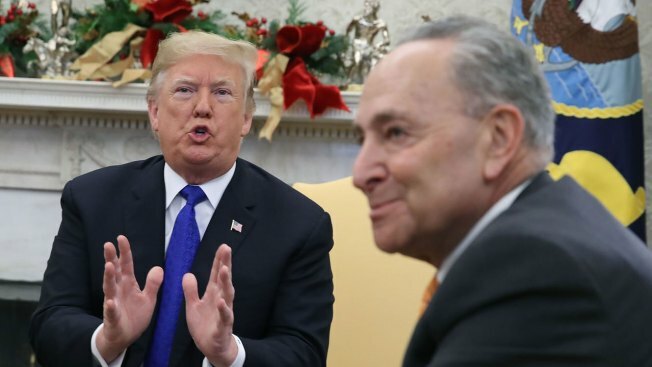 After a few niceties, Trump dug into Democrats on the border wall, prompting a stern rebuke from Schumer that the issue at hand was "called funding the government." Trump soon started scrapping with Pelosi, when she said there should not be a "Trump shutdown." "Did you say Trump?" the president said, as the two argued over whether Trump had enough Republican votes in the House to support his border wall plan. "The fact is that you do not have the votes in the House," Pelosi declared. Trump shot back, "Nancy, I do." Also in a fighting mood, Schumer accused Trump of threatening a shutdown "because you can't get your way." Trump heckled Schumer over a previous shutdown, saying "the last time you shut it down you got killed" politically. Pelosi and Schumer both repeatedly asked to make the conversation private, without success, as Trump argued that the public meeting was a good thing: "It's called transparency." Trump repeatedly returned to his argument that the border wall is needed for security reasons. He also argued that "tremendous" portions of the wall have already been built. In fact, some barrier renovation has happened, but little wall construction has been completed under Trump. Hours after the meeting ended, a Pentagon spokesman said in a statement that "there is no plan" for the military to build sections of a border wall. 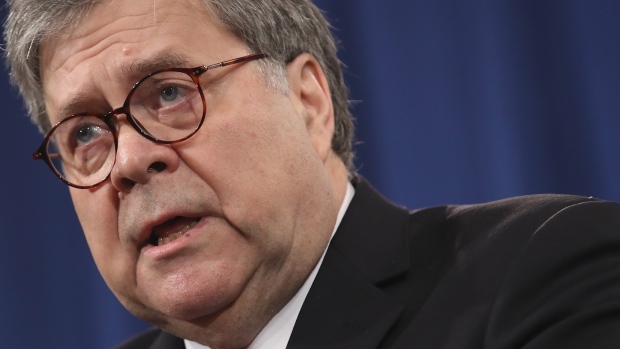 But Army Lt. Col. Jamie Davis added that the military may have the power to fund "barrier projects" in national emergencies or to counter the drug trade. Pence, a former House member, sat silently as Trump and the two Democrats bickered. He later called the meeting a "good discussion." Asked to describe the atmosphere in the private meeting that followed the public quarrel, Pence said, "candid." Pelosi and Schumer have urged Trump to support a measure that includes a half-dozen government funding bills largely agreed upon by lawmakers, along with a separate measure that would fund the Department of Homeland Security at current levels through Sept. 30, the end of the fiscal year. The homeland bill includes about $1.3 billion for fencing and other security measures at the border. If Democrats have a better way to secure the border than Trump's $5 billion plan, "they need to come with an alternative," Scalise said Monday on Fox News Channel. "They can't come and say they want to shut the government down for no reason because they don't want border security. They'll lose that argument with the American people." In fact, Trump declared during the presidential campaign two years ago, "That wall will go up so fast your head will spin." Pelosi's willingness to stand up to Trump won praise from Democrats. Rep. Eric Swalwell of California told CNN that she "may have sealed her speakership by going toe-to-toe with the president." Despite the rancor, Senate Majority Leader Mitch McConnell said he hadn't given up hope that a shutdown can be averted. The Kentucky Republican said "magic" sometimes happens in Congress ahead of Christmas, when lawmakers are eager to leave Washington. Associated Press writers Lisa Mascaro, Jill Colvin, Deb Riechmann, Laurie Kellman and Alan Fram contributed.